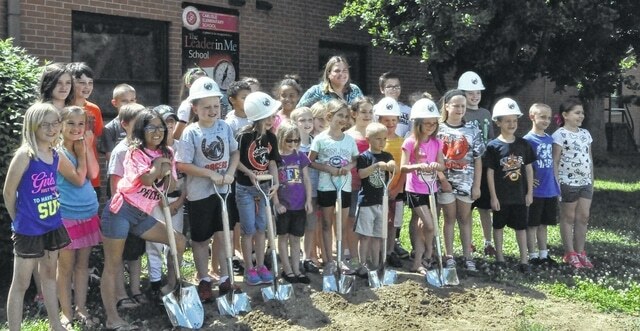 Carlisle Elementary School students posed with their principal, Renae Schwartz (back row in green), Tuesday afternoon at the Delaware School District’s ground-breaking ceremony for Carlisle’s building project. The school will be receiving more classrooms to accommodate fifth-graders as well as other improvements, like a gym, more parking and a revised bus loop. Construction will begin this month and is expected to end by the start of the 2017-18 school year, when the district will return to the standard K-5 configuration at elementary schools.